As one of the most popular apps all over the world irrespective of the smartphone platform, WhatsApp is continuously striving to give its users the best feature possible through various updates. The upcoming Android version of WhatsApp shows two such promising aspects that comprise text formatting and file sharing. Although not made available on the app store for user download, the OTA update is up on Google Play ready for beta testing. It must be noted that these updates are currently not developed for any other operating system. Also, Android users with WhatsApp v2.12.510 installed on their handsets will not be able to take advantage of these updates. To use these features, make sure that your WhatsApp version is v2.12.535. Moreover, the receiver of the messages should have the same version installed for the text to be displayed correctly. If not, the text could appear as some weird format at the receiving end. Ever wondered if it is possible to send a WhatsApp text in either bold or italics format as in a Word document? With the latest Android, you can do this without any hassle. To send a word or a phrase in bold, type the content in between to asterisk. For example, if you want the word bold to appear as bold in the message you are sending, type it out as *bold*. Similarly, to send the text italic as italic, just place it in between two underscores as _italic_. Now that is very simple and straightforward. If you thought that the bold and italic text formatting were restricted to messages, WhatsApp has another surprise for you. The app takes it one step further by applying the text formats to the notification alerts too. The messages pop up in the notification tray in the same format as you send them. Additionally, when you send a message, your name appears in bold format in the notification dropdown box. Although WhatsApp also tried to create strikethrough effects for text, they have not been successful so far. However, the app has not given up on this and you may be able to see this implemented in some other upcoming update. 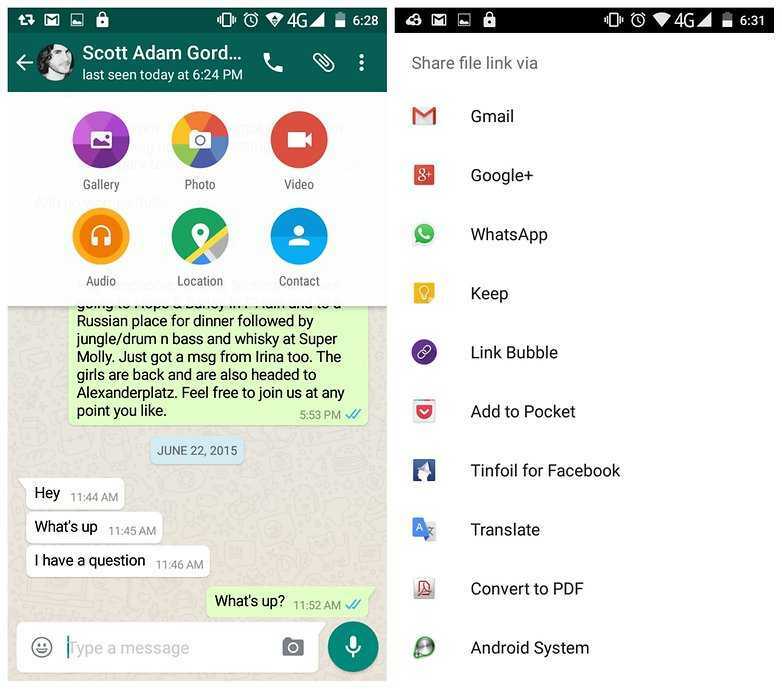 PDF sharing was one of the latest updates made available by WhatsApp running on any platform. However, this sharing was restricted to only PDF files of less than or equal to 100MB saved in the device storage. The upcoming version allows you to get this sharing done from two other locations as well – your Google Drive and Microsoft OneDrive. Interestingly, when you share your files from Google drive, WhatsApp allows you to send across any kind of file that include Word documents, Excel sheets and PowerPoint slides. Google Drive will automatically convert the chosen files to PDF format before transfer and send them across in this format. In other words, the receiver will always get your files as PDF. However, there is no need for you to be unduly apprehensive about this. WhatsApp will make sure that the encryption takes place properly and the receiver is able to download and interpret the files without any problem. Apart from the above two major updates in the 2.12.535 version, there is a small change in what happens when the update takes place. WhatsApp will continue to block the app when it is getting updated and make it inaccessible during this time. However, now a progress bar is displayed that gives you a fair idea on how long you will have to wait to resume using the app. One other thing you will notice is that the new Settings screen does not display your mobile number. Earlier versions displayed these details right in front on the center of the screen along with your status, photo and name. All the updates work perfectly fine on the WhatsApp beta version and can be expected to be implemented on the live and running version of the app any time. However, it may be noted that WhatsApp has not given its users any clue when this will happen and when they can start using these features to make their communications livelier than before. To get a feel how these two updates work, you are always welcome to try your hands on the beta version that is readily available on the app store.